Before you start this book, please note it is a continuation of the author’s Amos Decker Memory Man series. I would start with the first book, Memory Man, and then read the rest of the series in order before this edition or you won’t make much sense of the characters and situations. Bottom line is if you enjoyed the previous books of the series you will enjoy this one, also. 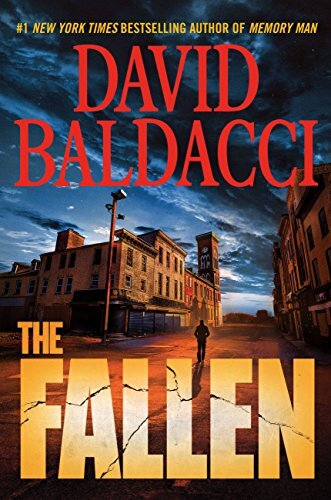 Baldacci picks up where he left off with the cast of characters and does his usual good job of changing the twists and plot lines: I stayed up really late with an unsuccessful effort to finish it because I didn’t want to put it down. I recommend this one for those who have enjoyed the series, and I’m ready for the next installment. This was an intense read through out. Loved the ending. Amos becoming compassionate and empathetic added depth to his character. I was so disappointed in Baldacci’s last Will Robi novel that I almost didn’t buy this one. This book is the Baldacci that I have enjoyed for many years. We all acknowledge David Baldacci is a master storyteller. This book exemplifies how an author can spin a story like a tapestry, and let it unfold at its own pace. Amos Decker and his partner are visiting her sister in Barronsville, PA, a small town. Amos stumbles into a crime scene, and what unfolds is a harrowing story that takes in today’s headlines, the opioid crisis, and takes Decker and Jaimieson on an epic investigation that leads to some surprising conclusions. On the way we they make some new friends. And enemies. In the end, Amos finds himself more in touch with his humanity than since his injury, and Baldacci shows us humanity and kindness in the middle of sorrow and loss. This was a great book, and interesting investigation, and showed Amos Decker making progress in regaining a degree of his humanity he has not known since his injury and the subsequent loss of his wife and daughter. Baldacci, like Brad Thor, Lee Child, and Ted Bell, invest a lot in inventing their characters. We have an emotional stake in them as well. This, my friends, is as good as it gets. This book was wonderful. As the Memory Man series proceeds, we see more and more of Amos’ personal story. The criminal element of the plot (one which is extremely relevant at this time) was very interesting and fresh, and the personal aspect of Amos’ life and past was really lovely. For me, this book was the best yet. I couldn’t put it down. David Baldacci is one of my favorite authors and has never once let me down. Don’t hesitate to buy this book, it is worth every penny and then some!